These fun little energy bites are just like eating monster cookie dough. There is no baking, chopping or work involved. Just stir up the goodness and roll them into balls. Easy peasy and perfect for snacking! Sometimes in life you just need a little snack. Whether it's an after school snack, or after work snack. Maybe it's a 3:00 slump snack... or just because you're hungry, bored, tired, happy, sad, silly or just because you're awake snack. No matter what the reason for the snack, these little gems are the perfect thing! Monster cookies are an all time favorite treat in my family. They are so delicious and none of us can say no when MiMi bakes up a batch. She used to freeze the dough so she could bake up a few fresh cookies each day after school. Homework is a lot more tolerable when there's a plate of warm and fresh cookies around! While keeping some dough in the freezer to bake up is a great time saver, sometimes there us no dough in the freezer and sometimes turning on the oven feels like a bit too much. I'm sure we've all been there. That is where these little balls of delight come in. They whip up in a couple of minutes flat. They don't take anything more than a bowl and spatula so they are perfect for little helpers as well. Plus with no raw eggs or flour, there is no concern about eating the dough. That's the finished product! You can even eat them right away, though they are more set up and the texture evens out if you refrigerate them for a bit. 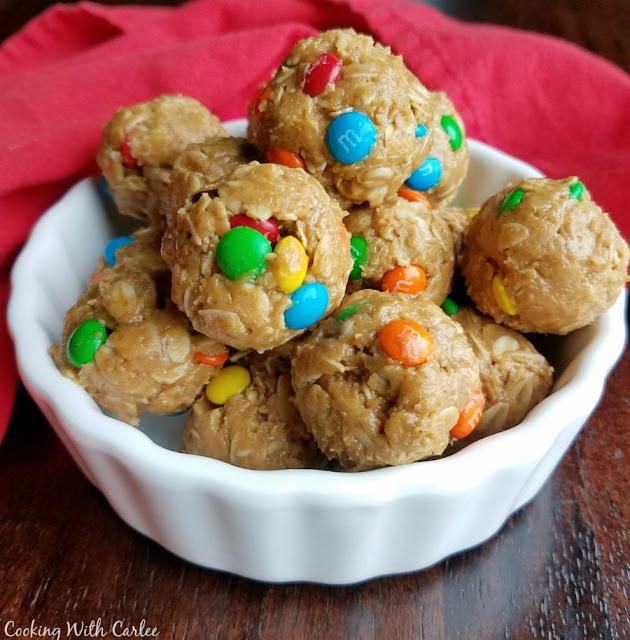 If you need a little pick me up, fun after school snack, project to do with the kiddos, after workout treat, fun roadtrip snack or a million other reasons, these puppies are for you! 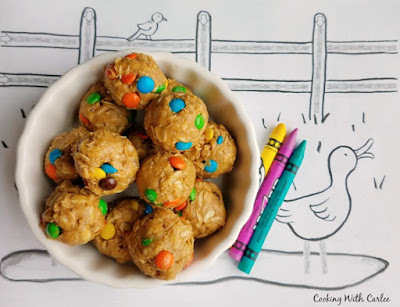 Miss K got us started back up on fun treats like these when she shared her Chunky Monkey Oatmeal Balls. Have you ever made energy bites like these? What are your favorite kinds? Roll into small balls, about an inch in diameter. Refrigerate for an hour or two to set. Store in an airtight container in the refrigerator until ready to eat. I was just thinking the other day that I needed a new, little snack bites recipe and you know how I adore monster cookies so WIN WIN!! These are perfect! I hope you enjoy a nice, long weekend pretty lady!! Thank you, they are so easy and really delicious! I hope you had a nice long weekend too, Andrea! Yum! Those are almost perfection- I'd have to throw in a few mini chips for good measure 🤗 I can't wait to make these! That's certainly not a terrible idea! :-) They make me happy too! Thanks so much for stopping by! We're totally related. I'm always eating just-because-I'm-awake snacks :). And these look perfect for snacking. YUM! Those are my favorite kind of snacks! Thanks, Kelsie! Yummy! I love these for an after school snack! I bet your kiddos would love them too! Hi Cralee, these do sound interesting! These days I'm the one hankering after that mid afternoon energy fix and these past few weeks my energy snack of choice o anything with chocolate. These maybe a healthier way of me beating that afternoon slump! Cookie dough does rank up there pretty close! Thanks, Amy! I might have to try these for an office snack. But only taking 3 or 4 with a day, because otherwise you know what would happen.... gone like magic! It's hard to stop if you have the whole bowl of them in front of you. I am definitely speaking from experience there. But a few in your lunch is perfect! I want to eat a whole bowl of these hehehehe. Thanks for sharing at Friday Frenzy Link Party! PINNED! It's easy to be tempted to! Thanks, Kelly! Can u still make these into cookies? At what temperature do u cook them? Do you use quick or regular oats? I use regular because that is what I normally have on hand. 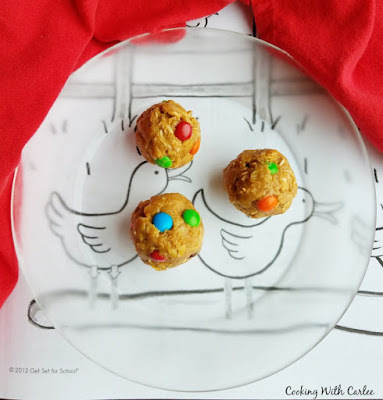 I have not tried it with quick oats, but I would think they'd be ok.
Great Cookie Bites for "All Ages", yum! I really appreciate you sharing with us at Full Plate Thursday and hope you are having a safe and enjoyable weekend. I agree, they are perfect for all ages! Thanks!